Gogron gro-Bolmog is an Orc assassin for the Dark Brotherhood living in the Cheydinhal Sanctuary. Gogron puts a lot of effort in improving his combat skills for his contracts and will spend most of the day practicing in the Training Room from 6am to 6pm. However, he also knows that even he needs to take a break from his training; once he has finished, he will head to the Living Quarters to have his only meal of the day. After he finishes eating at 12am he will decide to take a relaxing stroll around the Sanctuary Hall until 3am, always preferring to wander near Vicente Valtieri's Private Quarters. Once he has had enough for the day, he will return to the Quarters to sleep for a brief moment of three hours. His equipment consists of a full set of leveled–possibly enchanted–heavy armor, excluding the helmet. He is armed with a leveled battle axe–always enchanted–and carries an unenchanted steel battle axe, a key that unlocks the abandoned house door, his chest key, and a leveled amount of gold. He has an ability which grants a resist magic and a resist normal weapons spell. Gogron: "But why, Sister? What is the point? Why should anyone bother with all that sneaking and skulking?" Telaendril: "My dear Gogron, you are a life-taker for the Dark Brotherhood! Our very existence relies on shadow and deception. Do you not value our secrets?" Gogron: "Yes, yes, of course I value our secrets, and I have never betrayed them! But using stealth to kill.... It's just so... weak." Telaendril: "But Brother, what of the contracts that require subtlety! You must at least strive to earn the bonuses that are offered?" Gogron: "Bonuses? Ha ha ha ha ha! Useless, I say! Gold and magical trinkets are no substitute for the freedom to slaughter anyone I please, at any time!" Telaendril: "Oh, Gogron! He he he he. Your methods may be crude, but your heart is always in the right place." Despite his crude methods, he is quite friendly to his fellow family members. When you approach him for the first time, he will happily greet you: "There you are! Welcome! Welcome!" Regardless, Gogron is well aware of his strength, as is evidenced when you first talk to him:"Welcome! Welcome to the family! I'd hug you, but Ocheeva told me not to." When you ask him about the speaker of the Black Hand, Lucien Lachance, he will have a few words to say:"I once saw Lucien deal with an insubordinate Brother, someone who had broken the Tenets. It took me a week to get the blood off my boots." When you ask Gogron about Sithis, he will reveal that he knows very little of the Dread Father: "Truthfully? I've never really understood who or what Sithis really is. As long as I obey the Tenets and fulfill my contracts, I guess he's happy." When you ask about the sanctuary, he will jokingly reply: "You know what they say -- home is where you hang your enemy's head." On the Night Mother, he will say: "I don't know who the Night Mother is, but she pays me to kill people. My own mother should have loved me so much." The other members of the Sanctuary are well aware of Gogron's brute strength, too, and if you ask Telaendril about rumors, she will give you some background on Gogron's childhood:"Oh, I shouldn't...well all right. Gogron had a pet rabbit as a child! He petted the thing so hard he crushed its skull! Ha ha ha! What a brute!" Gogron claims to have had a relationship with her and will tell you that "Hey, I don't like to tell stories, but Telaendril and me... you know. Don't believe me? I've got her undergarments to prove it! Ha ha ha ha ha!" 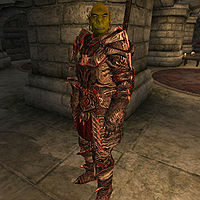 If his disposition is high and you are a fellow Orc, he will greet you with: "You and I, we've got to stick together, eh? The others, they don't understand. Orcs may not be quiet, but can anyone kill as well as us? Never!" If you are of another race, he'll instead say: "I know what you're thinking! Gogron, he's too big to be sneaky! Well you're right! Me, I like to just go in and hack my targets to pieces. Ha!" If his disposition is between 30 and 70, he will greet you with: "Yes, Brother/Sister? What can old Gogron do for you?" If his disposition is below 30, he will greet a fellow Orc with: "We are kin, yet I cannot help but despise you. Leave my sight, before I do something I regret." If you aren't even of his race, he will instead maliciously say: "You. What do you want?" When you leave conversation with him, his farewell dialogue also depends on his disposition. If it's friendly, he'll wish you well: "Happy hunting, my Brother/Sister!" If it's middling, he'll just say, "Later, then." If it's hateful, he'll threaten you: "Damn the Tenets! I'll cleave you in two if you don't get out of my face!" This pattern also happens when you approach him. If above 30, he'll say, "Hail, my Brother/Sister!" If below 30, he'll threaten you, "If not for the Tenets, I would slay you where you stand!" "So, your first contract. No chance for a bonus, huh? That's all right, you're better off! Who needs magic items when you've got raw skill? And the great thing about killing a target up close and personal is you can talk to 'em before you do it! You know, say something scary! For example, this one time I had a contract to kill a little Nord girl at her birthday party. She asked me if I was the jester! So I said to her. "No, I am a messenger of death." You should have seen the look on her face! Ha ha ha ha! Anyway, she won't be seeing age six!" "What's the matter, can't handle the pressure? Or maybe you're just... weak." "The manservant's name is Gromm, you say? Sounds like a Nord. Probably a big one. If he catches you, get ready for a serious fight." "What's the matter? You can't kill an old man? Want Gogron to hold your hand? You make me sick!" "Infiltrating the Imperial Prison is no small matter. Those guards are heavily armed and professionally trained. If discovered, don't be a fool. Flee!" "I can only pray that you break the Tenets and surrender to the guards. I will beg Lucien for the right to kill you." "What? Fake a death? And you can't even kill the enforcer? I don't envy you, friend. But a contract's a contract. Just do what you've got to do." "What a pathetic contract. Play acting and running, but no actual killing? I can see why Vicenti gave it to you... coward." "Now this is what I'm talking about! You kill him up close, face-to-face, and you still get the bonus! I wish all the contracts were like that." "Ha ha ha ha ha ha ha! By Sithis, you are an idiot! Ocheeva has sent you on a suicide mission! Phillida's men are going to cut you to pieces!" "What do you mean nobody can see you? Where's the fun in that? Damn the bonus, I say! Just walk in there and stab him!" "Oh, this is going to be funny! You're going to be the first assassin in Dark Brotherhood history who couldn't even kill an invalid! Ha ha ha ha ha!" "If you really plan on killing the guests one by one, make sure that when you strike, you strike hard. Don't want anyone running for help, do you?" "What's the matter, five targets too much for you? If Vicente gave me that contract I'd be home before supper." "Hmm. Don't get me wrong, that magic arrow sounds nice and all, but it seems to me like you don't even need to use it to get the bonus. As long as you cut off his finger and leave it in that desk, you'll get your bonus. Sounds to me like you can kill the old sod anyway you'd like. So what if he's wearing armor! You think that Imperial Legion scrap can stop a well-forged claymore? Not bloody likely! Ha ha ha ha ha!" "You're going to kill Adamus Phillida? You? Ha ha ha ha ha! Oh, it'll be a retirement, all right. Yours!" "Lachance gave me a special assignment once. Had to go all the way to Sumerset Isle [sic] for that one, killed me about thirty Elves. Ah, good times...."
Esta página foi modificada pela última vez à(s) 03h24min de 29 de julho de 2015.